The Magliner Gemini XL has the has the highest weight capacity in the industry with a whopping 1,250 lb capacity in the 4 wheel mode. Comes standard with a non-skid deck which increase stability and reduces product damages. 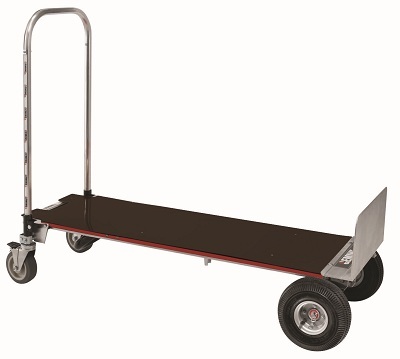 Based on industry norms using the Gemini in place of a standard hand truck will allow the driver to make 1 trip instead of 5! It will also save the average delivery person 8 minutes per stop and a total of 8 hours a week as well as lower driver fatigue by reducing muscle strain. Converts in seconds from a 2 to 4 wheel hand truck. Strong lightweight construction and a modular design which means that there are no weld points to break and all parts are replaceable. Available in junior and senior sizes with 3 choices of wheels. Comes unassembled in order to save you money. Check out the Magliner Gemini Junior here. Looking for something else? Browse all of our hand trucks. Advantages: I can carry twice as many three gallon bottles and half again as many five-gallon. That saves me time! Disadvantages: Obviously, you'll give up a few old (tiny) elevators to use this monster. It's also a bit heavier and clumsier to load onto the truck. I find the wheels get in the way when folding it up to stow. Have to hold it just right and let the wheels fall out of the way or kick them out of the way, or you just slam them into the frame and it doesn't catch. everything worked out great recieved the magliner 12/5 and used it for 12 hours today this saved me a lot of time the hand truck worked better than i expected. I received the hand cart, Magliner Gemini Extra Large about a about a week ago. We run a small family wholesale produce business for about 60 years. I am shocked at how well it handles a heavy load. I like the wheel brakes for when I need the cart to be still during loading and how I just lock or unlock the brake with my foot. I like the deck as I used to have to plan my stacking better. THIS CART WAS MADE JUST FOR ME, I AM VERY PLEASED.